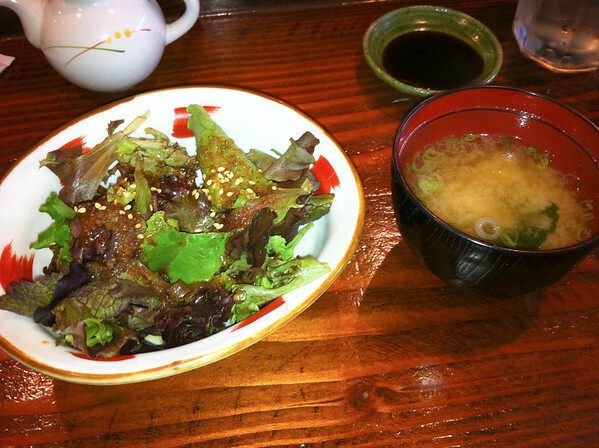 At our giant Go Sushi love-fest one of my Foodie Club members suggested I check out this Sawtelle sushi joint. He said it was great. Twist my arm! So I finagled a business lunch there (didn’t have to twist the other arms very hard either). The unassuming storefront on the corner of Olympic and Sawtelle, right next to the Yakatori place. 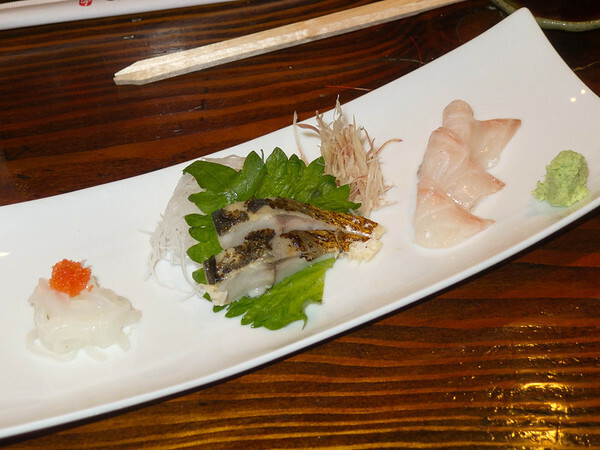 This first time we ordered a light Omakase, almost all sashimi with a little sushi. 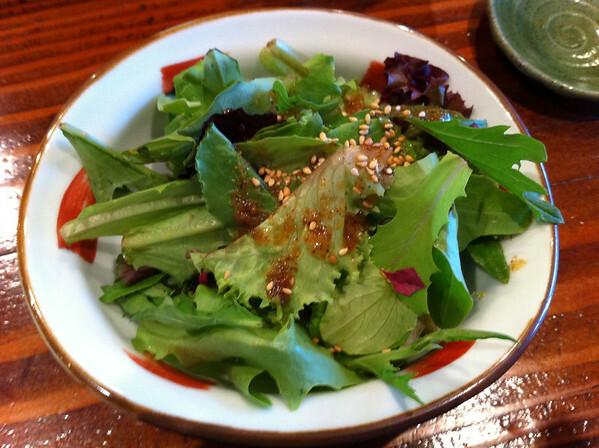 The classic Japanese salad with the yummy textured dressing. I forgot either of my real cameras and had to make due with the iPhone 4 (sorry). It really doesn’t do too bad a job if you have adequate light and turn off the flash. That little LED has a range of about 12 inches and isn’t good for much. 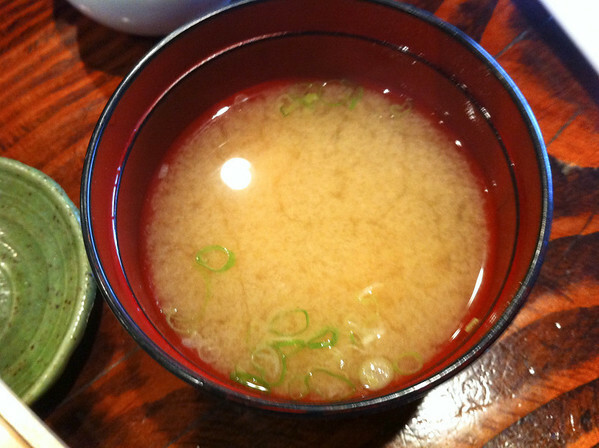 Miso soup, the usual sort. They had about four kinds on the menu though. 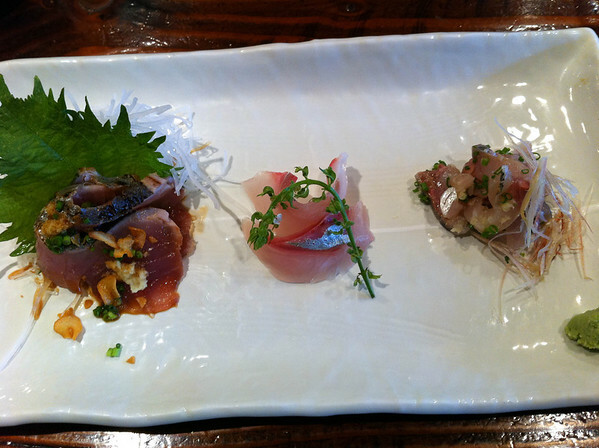 From left to right: albacore with garlic chips, baby red snapper, and mackerel with onion and similar. All very good and excellent preparation. 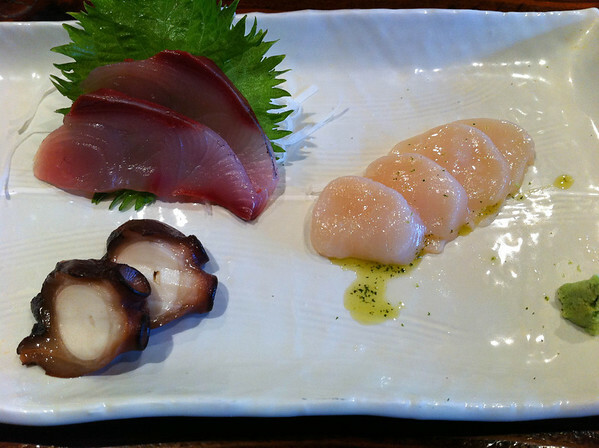 On the left, kanpachi (young yellowtail), taco (octopus), and on the right Japanese scallops with pesto. I hate eating octopus because it’s such a smart animal, but these were some of the most tender and succulent bits of cephalopod I’ve yet had. THe scallop was also fantastic, with the light pesto adding a unique flavor without marring the subtle sea taste. 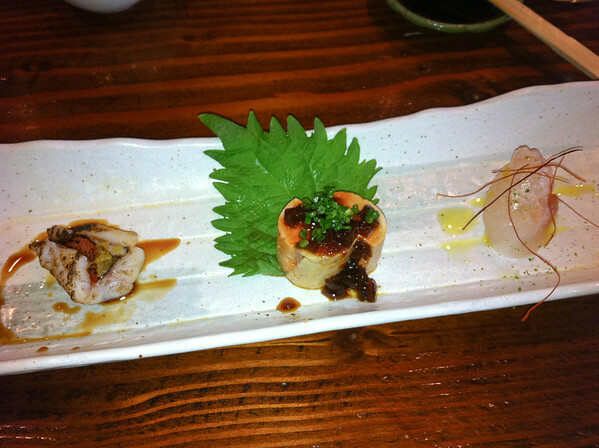 Left to right: Sock-eye salmon (light sauce), seared albacore, and golden eye snapper. The snapper almost tasted like lobster or something. 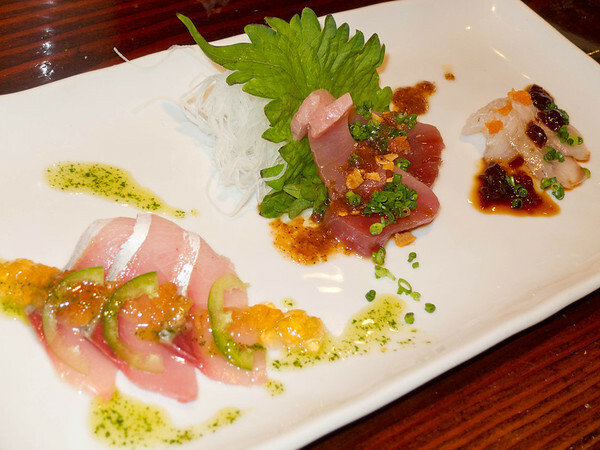 On the left: Big eye tuna and yellowtail, in the middle sea bream with salt and on the right homemade smoked salmon. All were great, but the bream and the salmon really stood out. 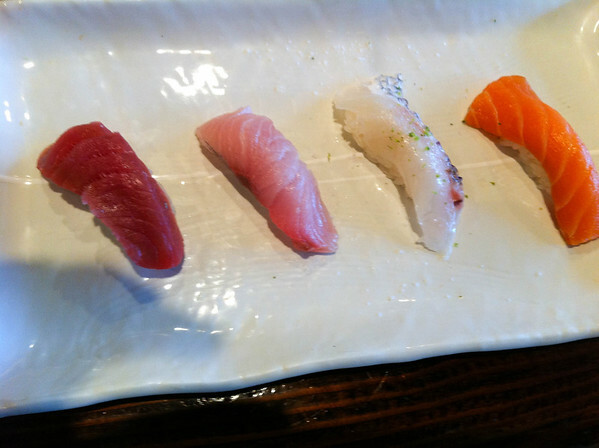 Sushi, left to right: Tuna, yellowtail, sea bream (with salt), and homemade salmon. 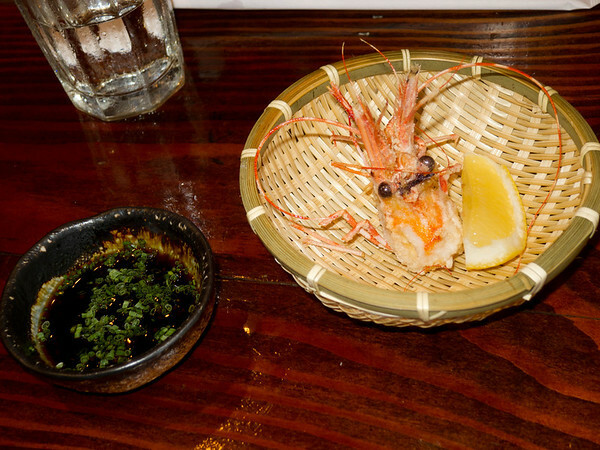 This plate was served at the same time as the similar sashimi plate above. 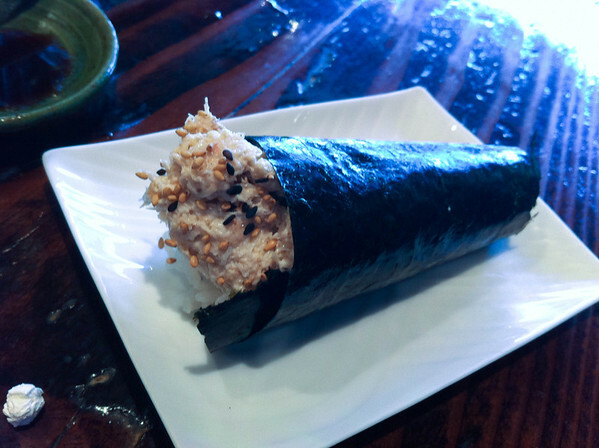 Blue crab handroll. Overstuffed and on par with the Sasabune ones. I went back two weeks later and ordered a more elaborate sashimi omakase, which is mixed in here with a simpler sushi/sashimi one. This time I had the medium camera so the pictures are better. 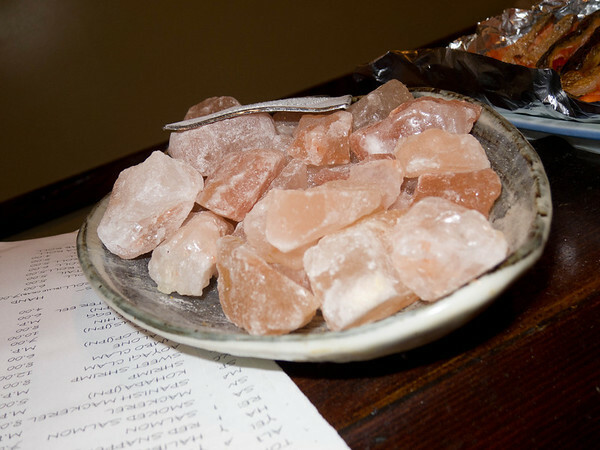 Some couple million year-old sea salt rocks on the counter. 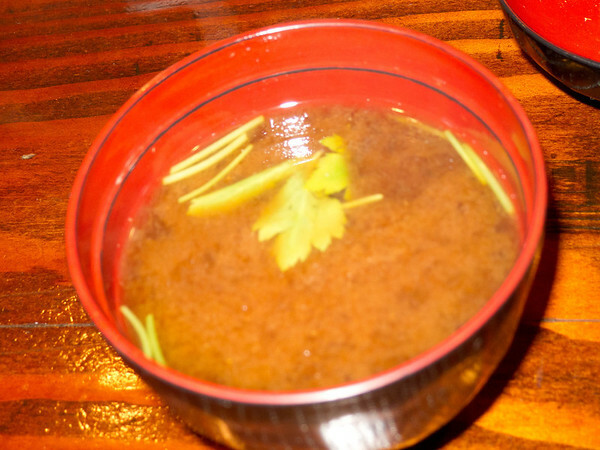 Red miso, which is saltier and richer. 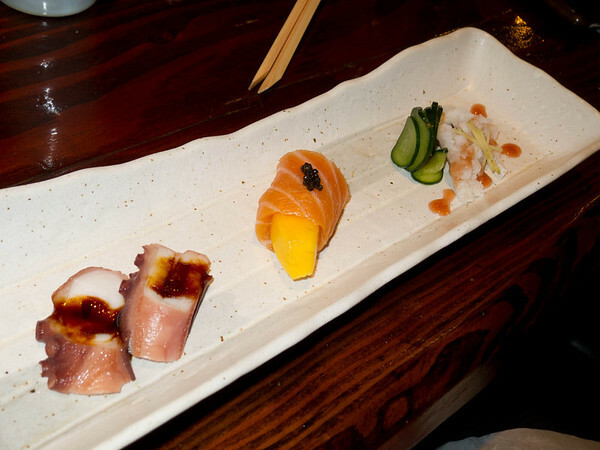 Octopus, salmon wrapped mango with caviar, and on the right boiled eel with plum sauce. The eel was interesting. It didn’t have much flavor (being boiled) but the sauce was very tart, tasting intensely of sour Japanese plum (which it was). The same thing but with an oyster instead of the octopus. 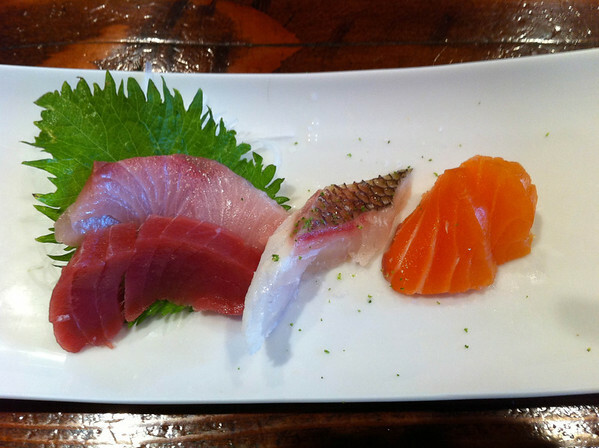 A sashimi plate, left to right. Wild kanpachi (young yellowtail) with pesto, gel, and jalepeno. Albacore with garlic chips, abalone sea salt. Halibut with ponzu gel. These gels (slightly sweet, interesting texture) are something unique to Kirko (in my experience). 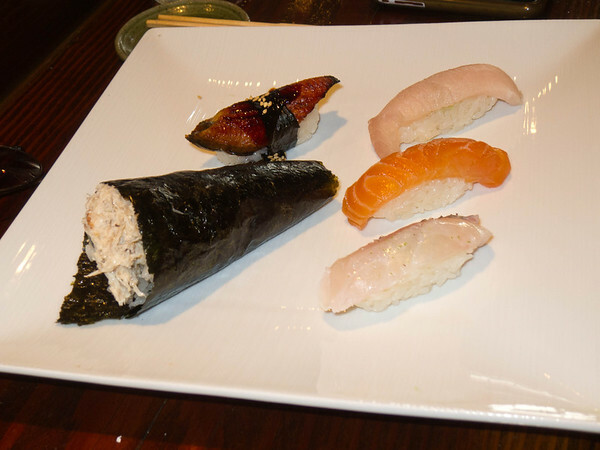 A sushi plate. 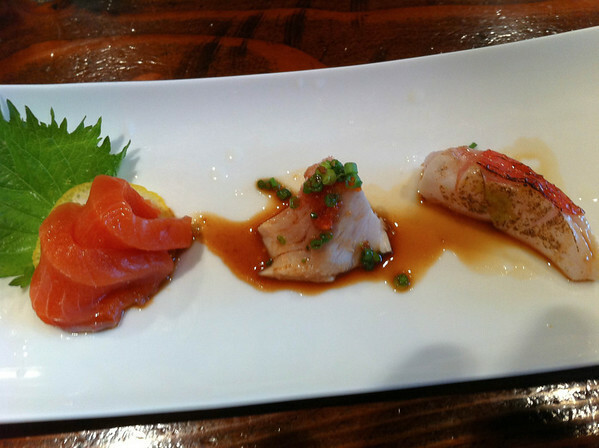 Crab handroll, BBQ eel, salmon, yellowtail and halibut. A sashimi plate that I forgot to photo until after I had eaten several items. We have starting in the lower left and heading clockwise. Tai (Red snapper) with sea salt. 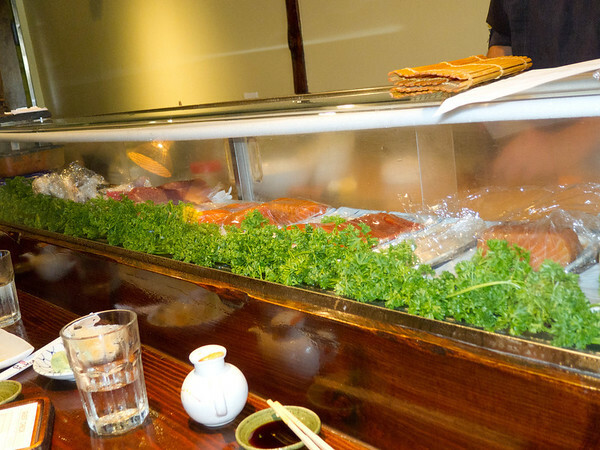 Chu-toro. 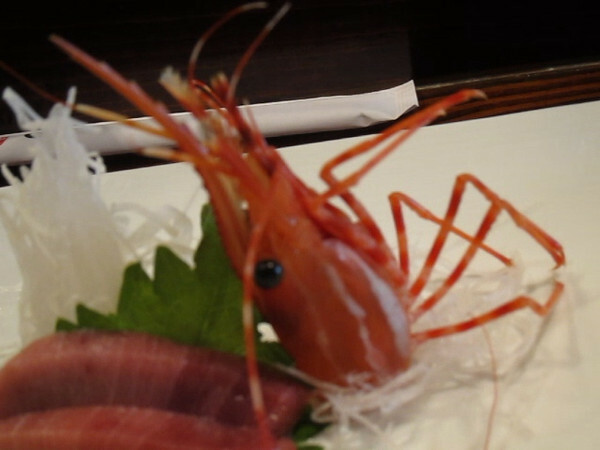 Santa Barbara spot prawn, live head and raw body (eaten). Japanese scallop with pesto. The head was so alive it was still moving. Click this image for a video. Then he came back fried. Most certainly dead this time. 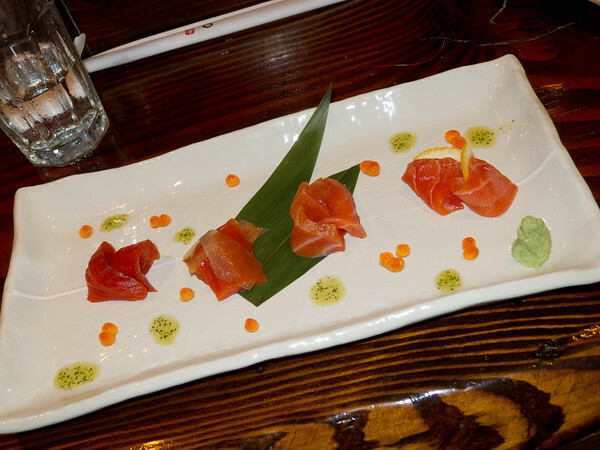 A sashimi plate of four kinds of salmon. Left to right: Sock eye smoked. Sock eye fresh. King salmon smoked. 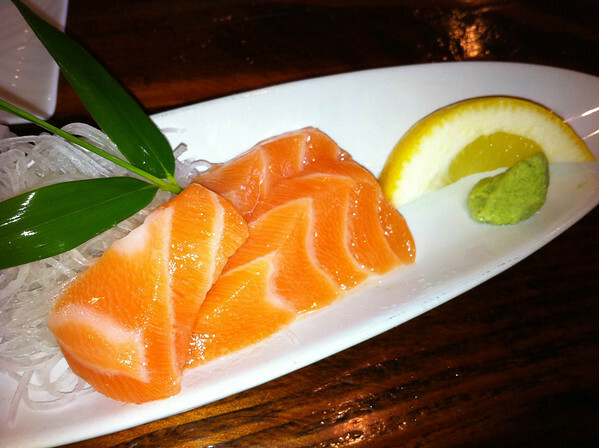 King salmon fresh. All good. 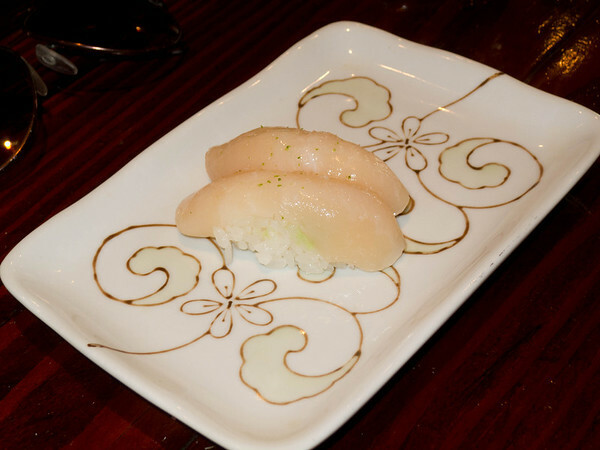 Japanese scallop sushi, with a bit of salt and yuzu. More sashimi. Squid with spicy cod roe. Seared Japanese Mackerel. Seam bream with yuzu. 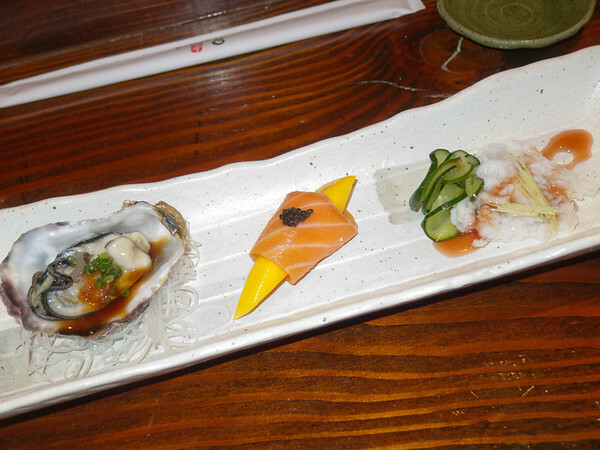 This is another “sushi and sashimi” lunch omakase. 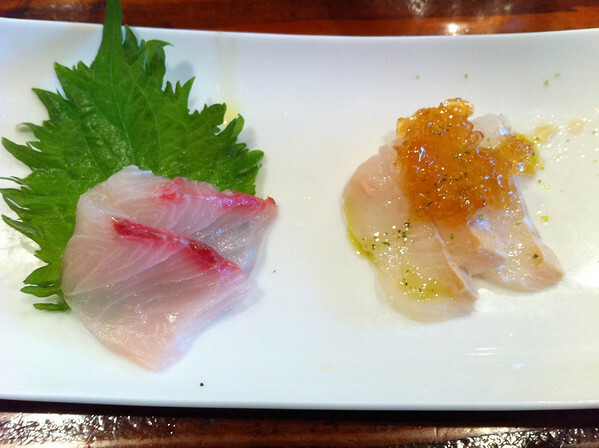 Seared snapper, monk fish liver with jelly, and halibut. 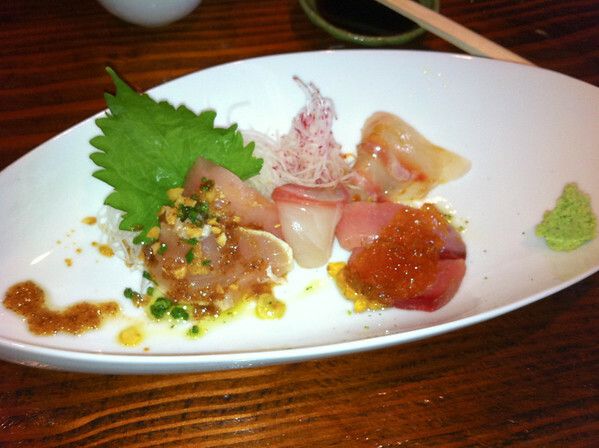 Albacore, seared and raw. 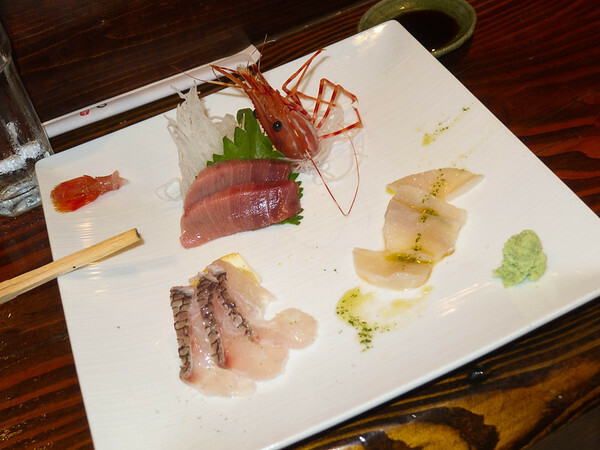 Amberjack, wild yellowtail with jelly in front and sea bream in back right. 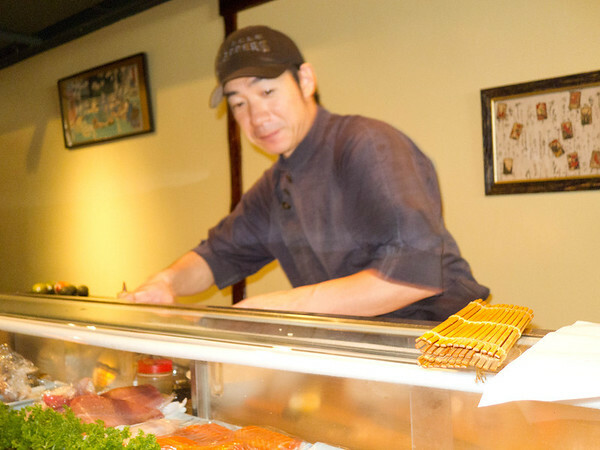 Bluefin tuna, wild yellowtail, sea bream, and salmon sushis. 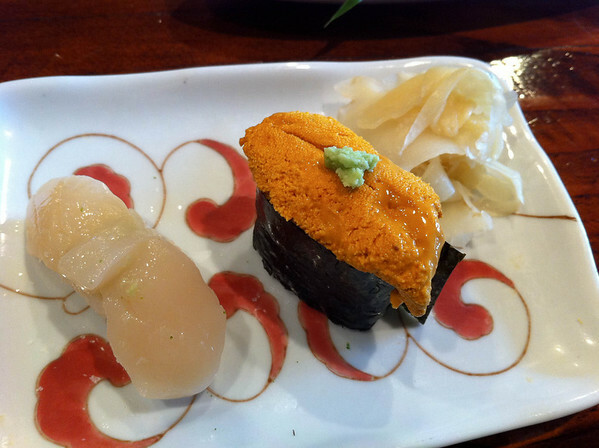 Scallop and Uni (sea urchin) sushi. 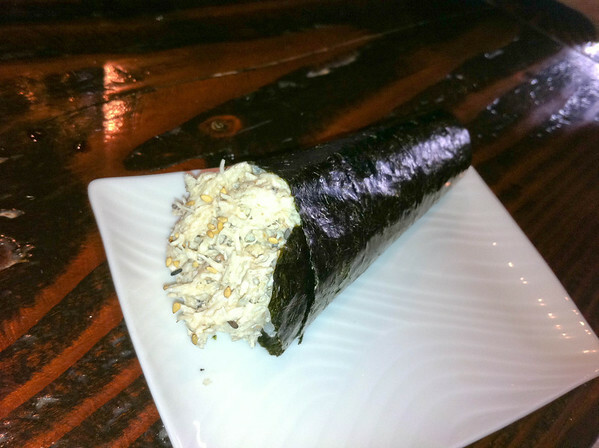 A top grade blue crab hand-roll. Overall, I was very impressed with Kiriko. Not only was the fish fantastic but they had very nice modern presentation and were doing some interesting stuff with the fish without going all weird and California. 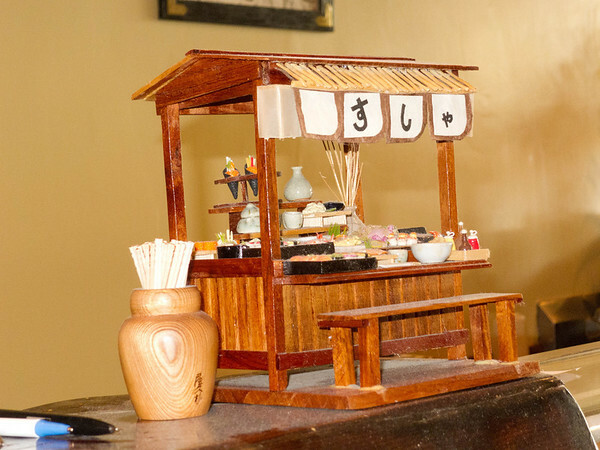 I’d put it in that grade of 9/10 LA sushi, which is saying a lot as our sushi is so fantastic. 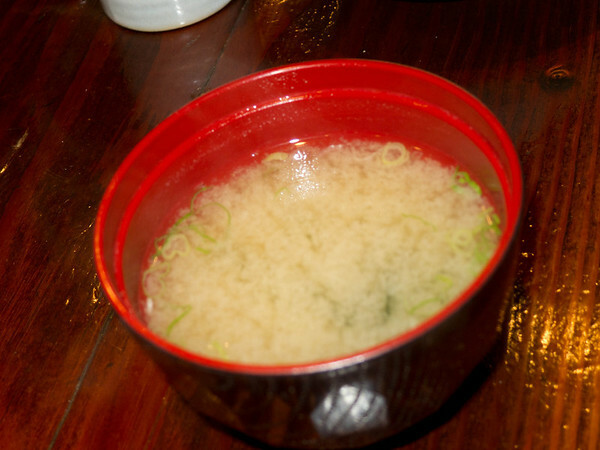 Click here to see more LA Sushi posts. 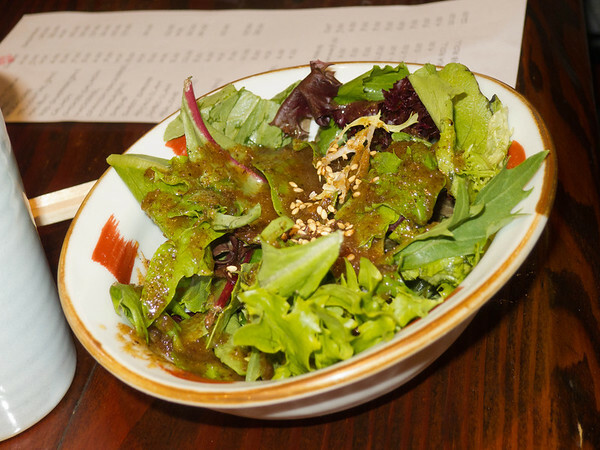 This entry was posted in Food and tagged Amberjack, Asian, Cooking, Fish and Seafood, Japanese, Japanese cuisine, Kiriko Sushi, Los Angeles, Omakase, raw fish, Restaurant, Restaurant Review, Sashimi, Sushi. 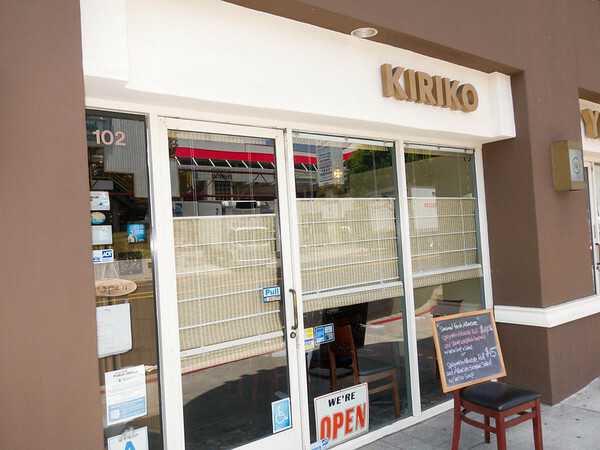 Just went to Kiriko this yesterday, and it’s arguably my favorite sushi restaurant now. I was wondering if I could use your first photo of the exterior for my post, as I forgot to take one myself.